Obituary for Rev. Paul J. Keebler | Bednarsky Funeral Home Inc.
Rev. Paul J. Keebler, 92, went to be with the Lord on Thursday, April 26, 2018. He passed peacefully at home. He was predeceased by his sister Eleanor Hastings of Endwell, NY. He is survived by his brother-in-law, Paul Hastings, of Endwell; his brotherhood of priests; and multitudes of people who knew and loved him. Born and raised in the Syracuse area, Father attended Nottingham High School. He was a US Army veteran of WWII and a POW, serving our country from 1944-1945. He received his Bachelor of Science in Pure Science as part of the very first graduating class of LeMoyne College in June, 1951. He taught mathematics at Jamesville High School 1955-1964. 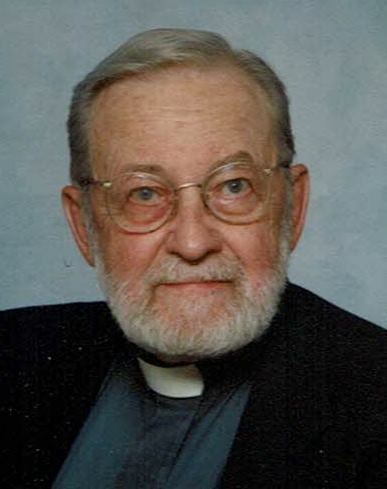 He then attended Christ the King Seminary school and was ordained as a Roman Catholic priest in the Diocese of Syracuse in 1966. He taught math at Bishop Ludden High School in Syracuse 1967-1980. While there he was also a successful coach of tennis, bowling, golf and basketball. After many successful years of teaching and coaching, he brought the message of Christ to South America where he served as a missionary for over 5 years. Shortly after his return he was appointed pastor of St. Ann's Church in Binghamton, (now The Church of the Holy Trinity). He served the Binghamton community over ten years until he retired to Windsor, NY. Even in retirement he served the Windsor community for several years before relocating to reside with his brothers at The Nottingham in Jamesville, NY. Father enjoyed all sports, playing cards with the men, was an avid golfer and loved to travel the world. He entertained many with his stories of his vast travels. He was known for his incredible faith, his devotion to the Blessed Mother and his selfless generosity. He touched the lives of everyone who knew him, and will be remembered always for his commitment to the well being of children and everyone he met. He will remain in the hearts of many, including the dear friends whom he entrusted with his care after retirement, especially Palmyra Citron, Robert Stewart, Michelle Andrews and Amy Mercadante. A Funeral Mass will be concelebrated at 11:00 AM on Wednesday, May 2, 2018 at the Church of the Holy Trinity, 346 Prospect St., Binghamton, with the Most Rev. Robert J. Cunningham, Bishop of Syracuse as the main celebrant. His body will be welcomed into the church at 4:00 PM on Tuesday. Family will receive friends from 4:00-7:00 PM at the church, where a Vigil for a Priest will be held at 7:00 PM. Burial will be in St. Mary's Cemetery, DeWitt, NY. Memorial donations may be made to the Church of the Holy Trinity. Arrangements by Bednarsky Funeral Home, Inc.